This issue is fixed in version 15.0.4841.1001 or later. Click File, Office Account, Update Options, and then click Update Now to update to a newer version. Outlook 2013's Mail applet will not open from the Control Panel following the June 2016 updates. Click-to-run installations are affected on all operating systems. When users click on the Mail applet the mouse cursor circles, then stops without the applet opening. Right clicking and choosing Open, or using the Run dialog to open the applet also fail. This problem affects users who install the June 2016 update for Office 2013 Click-to-Run, version number 15.0.4833.1001, or a later version. Most Office 2013 users will have a click to run version of Office 2013 installed, including all subscription installations. To verify your version information, click File, Office Account in Outlook (File, Account in other Office applications.) Then click About Outlook (or About [application]). Microsoft is investigating this issue and until it is fixed, users who need to create a new profile or open a different profile can either open Outlook using the /profiles switch or set a registry key to always display the Choose Profile dialog. Click the New button to create a new profile. To use the /profiles switch when you open Outlook, open the Run command using Windows key + R then type or paste Outlook.exe /profiles into the Open field and click Ok. 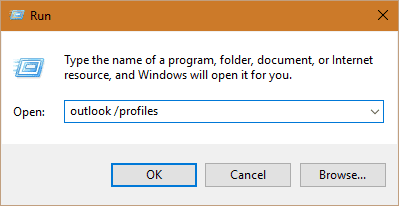 The option to always prompt for a profile when starting Outlook is stored in the registry. To add or change the value, open the registry editor and browse to and change the PickLogonProfile value. If PickLogonProfile does not exist, you'll need to add it. If you don't want to edit the registry yourself, you can download and run this registry file. And again. Under File - Office Account - Office Updates, I have three options: Disable, View, and About updates. I Disabled and re-enabled, didn't change anything. No "Update Now". it can sometimes take a few minutes to an hour before it finds the update, but i would give it 24 hours. Also, do you have the subscription version or retail? This is actually the fix for the MSFT control panel no longer opening. Comment from discussion brofurt's comment from discussion "Unable to open mail (Microsoft Outlook 2013) icon in Control panel". That link doesn't have a solution, at least not one that is easy o find. However, if your Office 2013 is fully updated, you shouldn't have problems as it was fixed in an update - if you do not have 15.0.4841.1001 or a later, you need to check for updates. It does if you expand it. I already had the version you posted. Running the above solved the issue. I noticed this problem and wondered what it was, but oddly, the control panel app has started working again. MS must have fixed something. Correct, they released an update that fixed the problem. opening outlook profiles work around fine for office 2016 after it got kaboshed by either current channel update or win 2016 early release. quick repair did not work.